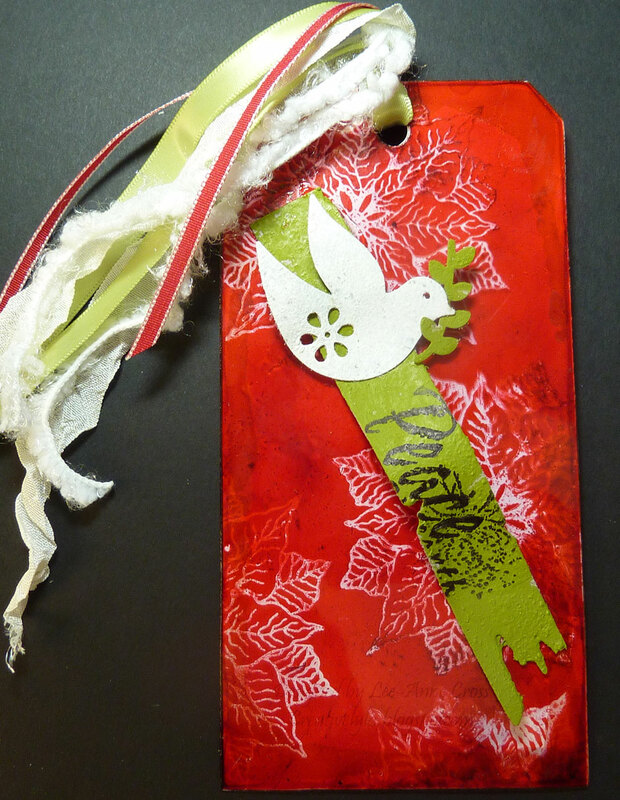 Well, I’m playing catch-up today…this is my edition of the Tim Holtz Twelve Tags of Christmas – Day Five tag. You can find his here, along with all his instructions. Using his technique for the tag, I’ve stamped a poinsettia image in place of his reflections stamps, which I don’t own. Next, I cut a piece of Grungepaper with the Tattered Banners die and inked it with a Lettuce Acrylic Paint dabber. Next the dove and olive branch were made with a Martha Stewart punch, again using the Grungepaper, and again inked with the Snow Cap Acrylic Paint dabber and Lettuce Acrylic Paint dabber respectively. The Tattered Banners die cut was then stamped with the sentiment. It was glued to the tag with Glossy Accents, leaving a raised area in the center. Some miscellaneous ribbons and fibers are tied through the top of the tag and done! If you’re looking for some really different techniques, be sure to check out Tim’s Blog! hey, Lee-Anne, I like the bold contrast of the red against that limey green. The white poinsettia field is a cool subtle touch. And I think you should have bonus points…you are incorporating the days techniques…messy, inky fingers~~~happy heart.